But incompency or conspiracy there is still known higher ups in the ATF caught with their pants down. Those not caught with their pants down are under tremendous personal pressure to cover up before these pantsless colleagues point their fingers and say "HE is without trousers too!" And, for clarification, this is the BAD kind of pantsless, Robb. Conspiracy? Incompetence? Combo of both? Combo of both in Olde English shite-tonne quantities? (I prefer the obsolete units. My truck gets 342,720 rods to the hogshead and that's the way I likes it.) At any rate, it'll be a bad year or 3 for the ATF and DOJ and others on the wrong side of this Rights issue. Order of events. If it’s a conspiracy. Obama is inaugurated. His career has had a constant throughout. More gun control. One of his first acts is to talk about how drugs murders in Mexico is somehow the fault of our gun rights. Trace numbers are trumped up that on the surface support his warped way of thinking, but the lie is quickly put paid to and called the Gun Canard. His Secretary of State gets in on the act. Heck Michael Yon gets in on the act. His Attorney General gets in on the act but goes a step too far and mentions that gun control legislation is a distinct possibility. This trial baloon, or unforced error tipping their hand, goes over like it was made of lead, filled with hydrogen, and on fire. There is little popular support for abridgement of the 2nd Amendment and the political climate, even with Dems in charge, is not conducive. They have other fish to fry in 2009, and will bide their time and political capital until after they socialize medicine. So either the president takes Holder aside, or Holder comes up with a similar internal monologue: "No movement on disarming US subjects can go forward unless things down Mexico way get worse. We need a tragedy or unacceptable and frightening environment or crisis to ram gun control legislation through. If somehow the violence in Mexico got worse and scarier looking, and we could make that look like the bitter-clinger NRA types are at fault… This may take some time, but if we prepare the ground properly now it will give the weak kneed legislators political cover." Holder comes up with a scheme to make the Gun Canard look more true after the fact. Get more firearms traceable to US gun dealers into Mexico, where there is already extra strife in drug cartel’s power struggles. Holder sets the ATF to make this happen. The ATF can easily cow gun dealers into agreeing to participate. After all, the Feds can destroy the store owners livelihood with impunity and at a whim. "We don't like the handwriting on the 4473..."
An operation that on the outside kinda looks like the ATF is tracing straw purchasers to their customers is in reality literally arming drug cartel soldiers with some US sourced firearms. There is no effort at all to trace a gun that crosses the border south, and their cannot possibly be. It kinda looks like gun dealers in the US are the cause of mayhem, if you spin it right and silence a few store owners with implied threats. ATF brass are too myopic to notice how transparent this perfidy is, or thinks that a friendly press corps will spin the scenario to the Left’s favor. They don't seem to consider that the cat could get out of the bag and information out of their control. On the front lines, ATF worker bees and participating gun dealers aren’t too comfortable with this scheme. The gun stores are silenced by assuring them that ATF has it under control, and besides, they have no choice. The gun stores keep records showing their concerns, just in case, you know? The ATF front line troops know the truth and how out of control it is and gripe up the chain about how lots of Mexicans will get hurt with these loose guns and maybe some US folks on the border areas. ATF agents are told to do their job or face reprisals and that “to make an omellete you have to break a few eggs.” Those broken eggs are people. These ATF agents remember the bad old days of the 90s where their bureau made some colossal screw ups and looked like thugs and suchlike and were hoping they’d rehabilitate themselve a bit by now. ATF agents start saving documents about such questionable orders from on high, just in case, you know? This is in early 2010. In late 2010 a border patrol agent is killed (on top of many Mexican citizens, probably, killed) with one of these weapons released to cause mayhem and political cover for rights restrictions. This is the straw that breaks the camel's back for some frontline ATF troops, and they start blowing the whistle, talking to pro-gun bloggers, talking to CBS. Details get reported in public, GOP Congressional committees start investigating too. Administration goes into lockdown stonewall mode in 2011. The cover-up and insulation of the higher ups goes into full force. No one in the upper echelon is talking (yet). The head of the ATF makes noises he is resigning, but that would mean he is free to implicate all involved, including the AG, unless they have something on him. But causing the deaths of innocent people through a harebrained anti-rights conspiracy is something that is also held over his head. To save his skin he might give up AG Holder. If Obama is involved Holder is certainly a firewall to protect him. But Holder presumably doesn’t want to be impeached and imprisoned for decades for causing the deaths of innocents so he may be rolled, as well. Then impeachment procedures for the President go into high gear if Holder doesn’t fall on his sword (he has already lied in congressional testimony over when he knew about Gunwalker). This all assumes the President is the source of such shennanigans AND, more importantly, he is covering up his complicity. Holder may be the ultimate source and covering up, or on down the chain. It all depends on how the last highest guy on the hotseat wants to avoid prison and is thus willing to point to his boss and testify "He told me to do it!" Ruger is coming out with a mag fed bolt gun that shoots .357 magnum. I like .357, so this might be interesting. If it was a lefty. But they already make a .44 magnum bolty, so I could have gotten one of those for my .45ACP silence rifle. If they made a lefty. I'm not even upset that it's a bit spendy. But it doesn't matter how much it costs. THEY DON'T MAKE A LEFTY. Pah. May the ghost of Samuel Colt, lefty extraordinaire (reportedly), haunt their gunsmithing nightmares. When she broke out the 629, no less than 8 people stopped shooting to watch her. KABOOM! It looks a bit like the Bersa Thunder (the Bersa is a clone). It shoots the same round, but it's not NEARLY as snappy in the recoil department. That Bersa is a monster. The Walther is pleasant. Anyway, the all metal Walther is clearly put together well. I like the fit and finish. Though I'm not a huge fan of the plasticky grip, that wasn't a problem. It's a DA/SA with a decocker, so if Trollop got one she'd have to get used to the difference. Presumably, in the unlikely event she went the CCW route with it, she'd chamber a round and put it on safety. When needed she'd flip off the safety, get a DA shot with the first, and SA thereafter. The magazine release is on the frame, so that's good, thought it's a little high up and not where you expect it to be if you've fired a lot of American designed pistols. But it's an advantage over mag release on my Colt Pocket Hammerless that is at the end of the grip. The sights on the Walther are much better than the rudimentary bumps on the old Colt, too. The only big peeve I had with it was the mag spring is VERY strong on it, making loading a chore. My mag loader is too big to be of any use in this situation. Unless resolved, it would make extensive practice a problem. After 2 boxes of ammo, my loading thumb would be torn up pushing those rounds in. But it's a fun little pistol. So I never watched but a few episodes of the new Battlestar Galactica when it was on. I remedied that with DVDs. For those 3 people that read this blog but are unaware of the world of television program, a diaspora of space humans is fleeing annihilation at the hands/servos of robot cylons in ragtag fleet and is seeking earth as a new homeland. They have the one military asset remaining to shepherd them to the promised land in the form of a space-Nimitz, the Battlestat Galactica. Now, because it is SciFi and military there are sidearms. And they can't use something TOO familiar to wider audiences, so they characters end up carrying guns that are real, but relatively odd looking and futuristic and often slightly modified. Thing Harrison Ford's blaster in Star Wars, which was a Mauser C96 (update/correction, thanks Clint) with a compensator on the muzzle, or his funky revolver in Blade Runner which was a Charter Arms bulldog with a Steyr bolt-receiver glued onto it and lucite grips. In BSG we see LOTS of different stuff. My favorite is a heavily modified S&W 686. So modified that you can't even recognize it as a revolver. The Beretta CX4 Storm is a prominent rifle, mostly unmodified because it looks uncommon and unconventional enough. Another solution they used is unmodified pistols that are conventional, but kinda furren. Like the South African Vektor. The movie trick with more recognizable designs, like AK patterns rifles, is not figure them prominently. I like this method of problem solving. And it's sort of necessary due to the sheer number of firearms required in filming. It would be much more expensive and less realistic to invent stage props out of whole cloth in the variety and numbers required. Have you noticed that when good production companies DO go the whole "invent a raygun" look they like to base it on most of an actual firearm. This allows the prop to be heavy enough to look substantial when held, and is easier for the actors to wield it in a realistic way. Carving something out of styrofoam and coating it in resin and painting it black you end up with something that doesn't FEEL like a weapon to the actors and then they don't tote like one. Like something they've seen throughout their lives in other movies, even if they have never handled a firearm before this movie/TV role. "Mix some snap caps in with your live rounds in the magazine." What does this do for me in improving my accuracy (obvious value practicing for failure drills)? I already know about the anticipation when I lose count with a revolver and try to fire the 'seventh' round. So I'll see the anticipation again. Then what? Tell myself 'don't DO that' and move on? I already tell myself that, too. ~click~ "Yup, I flinched. That's bad, according to all the books. Now what?" Big recoil guns, then switch to lighter recoil? Helps very briefly. Shooting a .45 feels like a .22 after a few cylinders of .44 magnum. Light recoil guns, then switch to heavier recoil? Same thing, only backwards. You'd hear about nothing else for the next 2 months, how stupid Palin is. But the President said it. So you'll read bout it here, and in a couple other places, and then it'll be swept under the rug. Because Obama and all Liberals is smart. And all Republicans and Conservatives be dumb. Not tother way roun'. 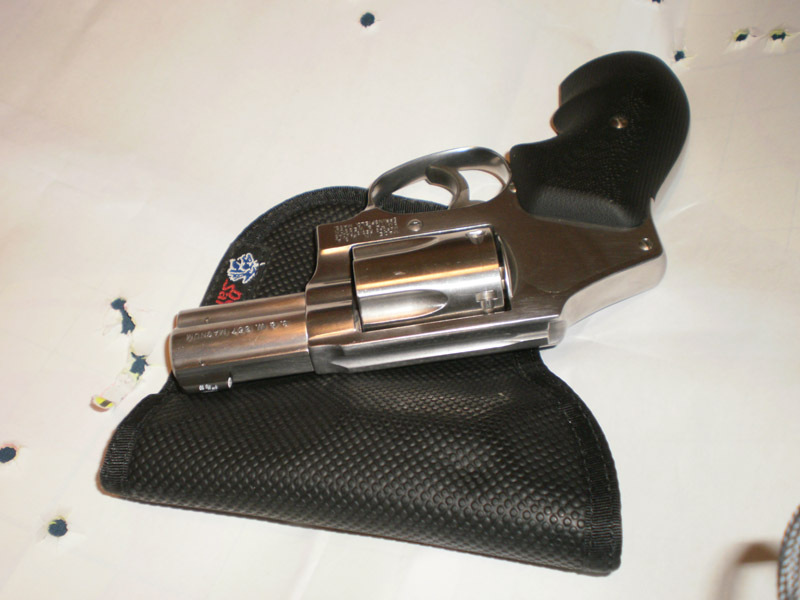 What are the legalities of the .600 nitro revolver? What interest would the ATF take? Well, if it IS considered a shotgun round, would that mean the revolver that fires it is a sawed off shotgun or some kind of destructive device? 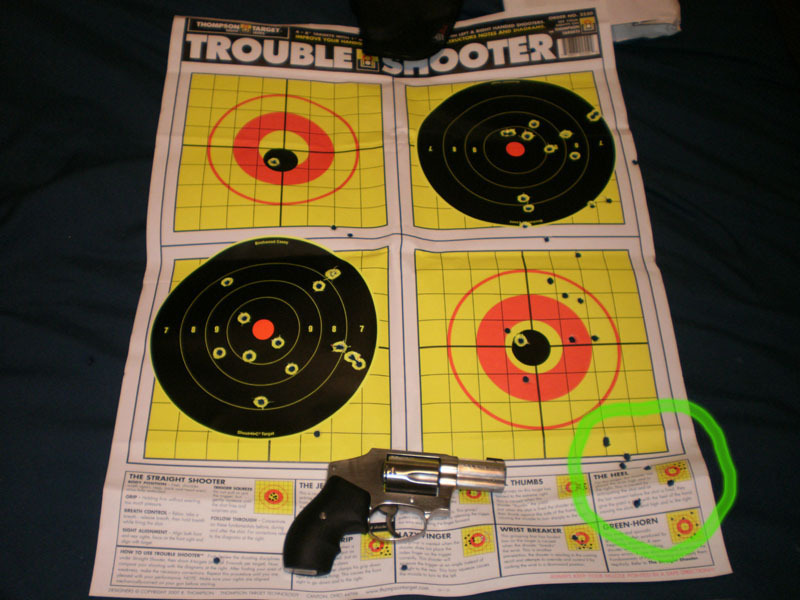 They are having enough problems getting revolvers approved that shoot something bigger than .410. Even when you WANT to obey the law on firearms regulations you can run into some serious weirdness without even trying. And this is just a mental exercise. I bet if I asked 4 different expert bureaucrats I'd get 5 different answers. So this whole Gunwalker thing... There are 2 explanation at the heart of this onion. Government officials conspired to release firearms to criminal south of the border and hoped for mayhem from said release. The death and suffering caused by these ATF supplied guns would lead to a shift in public opinion towards further gun regulations and provide prolitical cover to instigate further restriction to accelerate incremental moves toward a complete gun ban. Information indicates that if this is a conspiracy, it was known at the highest levels. High as the ATF director and probably the Attorney General and DHS Secretary. Possibly the president. The other explanation is sheer incompetency. Someone thought releasing guns would help law enforcement track them to criminal syndicates. Someone weighed the risks and dismissed them. Someone thought the situation could be contained, even cross border into foreign jurisdictions, and not spin wildly out of control. Even if mayhem was caused the resulting capture of badguys would lead to much much less mayhem in the near future and for a time after that. Someone thought that of COURSE the big source of firearms in Mexican Cartels was US civilian gunstores. That's the culture they live in, the "civvy guns are bad" culture and they can't even conceive of any net good firearms outside of police hands. Information indicates that if this is incompetency, it was instigated at the highest levels. High as the ATF director and probably the Attorney General and DHS Secretary. Possibly the president. If it's conspiracy, the deaths caused by Gunwalker are a cause of this conspiracy, and a felony. People belong in prison. If it's incompetency, well, people still died. Then the parties involved are only guilty of manslaughter. Much shorter jail term for that. But still accountable. Based on past performance, I am thinking that this whole thing is just sheer incompetence. No evil conspiracy or cat's paw, pulling the strings. See what happens when you give bureaucrats and politicians too much power? People get hurt, on top of the fiscal malfeasance. Give them less power and fewer get hurt, and less tax money, YOUR money, gets skimmed in graft and lost to waste. And they take less of your money in the first place. We have Peter Principled this political class, both parties, way above their collective abilities. There is no harm or disgrace in demoting them to something they can handle. Everyone will be happier in the long run. I have yet to settle on just one. Thoughts? Oh dear... This is a work buddy that has mined me for gun info in the past. He currently owns a Sig Mosquito and an AR. I told to choose number 6 for his third gun. None of the above. Some duty type pistol or a simpler shotgun. Working on him now. Don't get me wrong... Any of those choices would be fun to play with. But they are all a bit esoteric, no? And expensive to feed, for the most part. Especially the .454 revolver. First, it's a Taurus. Second, you'd get just as much fun with a .44 magnum and save a bundle on ammo. I bought the DeSantis Nemesis pocket holster, as my Uncle Mikes, while a good value, was looking tired. And there a promotional discount. The new grips are VZ Grips, and I like them MUCH better than wooden or rubber grips. If you've never tried those kinds of grips, do yourself a favor. I could not be more pleased with the way they feel. No, they don't pay me or send me swag or anything. Also, that's a new tritium foresight by XS Sight Systems. With J-frames, the big disadvantage is the little nubbin of a sight looking down in a fixed-forged rear groove. This is the smaller glow-in-the-dark job they sell. And it is bright. It might even light my face is a pitch dark room. Now the only upgrade I need is a camera and photographer. Sorry about that. As I get comfortable with the trigger pull, the low and right anticipatory flinch of mine appears, even with a DA gun. Interesting. Otherwise, I shoot DA better than SA, as usual. I should post a reward... $2000 for the person that fixes my pistol flinch with a 1911. That would be with a hands on instructor. I'll mail a $20 bill to anyone that fixes it via comments. Just a thought that's been rolling around in my head. I haven't had the chance to test Ritchie's advice. Need a full size semi-auto for that. I'd love to owe him $20. You know that old style house I was raving about that I live in and junk? Well, not much had been done to it in it's first 50 years. The first big thing I did to it was ADD insulation to the attic. Sheesh. And on top of that insulation, now, this weekend is a bajillion incandescent lightbulbs. I'm storing the hoard up there. They are light enough. I was semi-onboard with the enviromentalist dream of all twist CFL bulbs. The light sucked but they last 10 years. So it made economic sense. Scroo the Mother Nature side of the equation. Thing is, they don't last 10 years. They last the same amount of time as an incandescent. So while they are more expensive, at least they don't last longer. So the hell with them. I've laid in a 60 year supply. You can have my 60-watts when you pry them from my cold dead hands. Counter-Zombie Operations at the Fireteam Level. I'd be remiss not to share this vital field manual. They give a complimentary one when you join the RoMERO teams. Blog funk, I guess. Some days, it's easy. Others, it's like pulling teeth. Lessee... watching a Bill Murray movie called Quick Change. From 1990. In it, Bill plays a bank robber. Wearing a clown get up. It's pretty good. Gun content. He tries to shoot out the surveillance cams with the gun he brought. It looks like a Beretta. Same kind the army uses. Lessee.... Nope, it's a Taurus clone of same. Anyway, he can't hit the camera with THAT. Naturally. He resorts to using the old Colt revolver lifter from the bank guard. First shot hit. Yay, Muhrican firearms! It's what I would have used. He even shot it DA. Trollop is roping me into another range trip this weekend. Yay. She wants to rent something small. Her .44 Magnum covers her recoil jones, but she wants something teeny weeny. 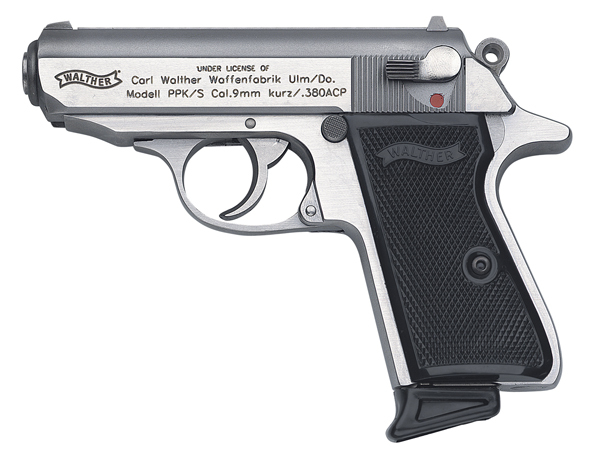 I am bringing the Colt Pocket Hammerless, and she is looking to rest the Walther PPK. The Snubbie she has tried, but it's coming too. We'll have to see if the rental case has an Elsie Pee or something, too. My flowers are starting to bloom. Ain't they pretty? See that brickwork behind it? I love that bond. Common, or American, Bond. A row of headers and five - seven rows of stretchers is the ideal brickwork bond, in my opinion. It's what attracted me to this house. That and other things. For one, it's a post war tract house made in the boom period. Brick and block construction, plaster walls, oak floors. Mine is only a 2 bedroom, which is fine for just me. It sold for $10,000 in 1951, a bit more than 10 times that when I got it, and at the height of the boom, the same model was going for 30 times the original price. It's still holding at 20 times. Because of the construction, when these types of houses catch fire they rarely burn through the roof. Brick and plaster is a boon. Another plus is for a little while longer there are still WWII veterans on my street to chat with. There was a decorated Marine on the corner that passed away before I moved in. He ended up leading the band for the Washington Redskins as a civilian. Kinda neat. Original owner tell stories about how the front yard was sodded, and three rows of the back were sodded. The rest was dirt back there. And the surrounding acres started out as cow pasture in the 40's. The interest in History serves me well with regard to these things. This guy is running for office in California (h/t Snowflakes in Hell). He is unclear on the concept of rights and want to change the right to keep and bear arms into a privelege. You can write the 2nd out of the Constitution, but you cannot repeal the right. He dares to compare his impetus to the Suffrage movement, ignoring one little detail. Suffrage was about expanding rights. His desire is about quashing rights. Any other amendments dealing with rights you want to repeal, Mr. Barkley? The 1st? The 13th? The 19th? Sebastian at Snowflakes doesn't mind him because at least Barkley is open and honest about his perfidy and can thus be properly addressed and opposed. As for me, Barkley makes me nauseous. He's a scoundrel, deserving nothing but contempt, and should be constantly watched with a wary eye, like the rest of his ilk. Speaking of gun nuttery. I've been trying to figure out what I want to get next, firearm wise. And I got nothin. No single model is tickling my fancy whispering "buy me! buy me!" Maybe this is a maturation. I've got one of each and a spare. I have a smallish gunsafe that is now full with same. I have upgrades to get. Things like optics and whatnot. But even those aren't jumping up and down on my covet button. Maybe this is a loss of interest. Hopefully temporary. The only thing I've been itching for is more target practice. I've been busy lately, but even then I should make time, no matter how busy. It's just excuse making. I'll mow the lawn tonite, and have tomorrow evening for the range. How? I didn't. It's not nuts to have a handful of firearms. But I am out of blog fodder right now, so I might as well mine Jennifer's meme. I became a history enthusiast in elementary school, reading library books about WWII, watching war movies on channel 20. That transferred over to an appreciation of surplus firearms. I remember thinking the Nazis and Hitler were pretty cool back then. Snazzy uniforms. They were just 'the bad guys' that the US fought. But I knew that we were the 'bad guys' to the Germans. And heck, my family emigrated from Germany in the 19th C, so I thought that in some parallel universe I'd have hailed from the part of the world. It took a few years before I fathomed the evil behind all the neato military equipment, and why the madness that threw the world into that war was to be absolutely abhorred, root and branch. Live and learn, emphasis on the learn. Silly 4th grader. Amazing was the tolerance extended by my teachers. Nowadays kids are getting expelled for showing an interest in combat and drawing guns. As for later in life, the interest in history served me well. If I wasn't going to hack it as an Aeronautical Engineer designing the replacement for the F-15, I could at least get a degree doing something I had a hobby in already. History leads to political awareness. And the realization that tyrannical systems I learned to eschew in elementary school could take different, incremental, deviously insinuating, forms. Widespread ownership of firearms was a thumb in the eye to such encroachments. It's not the only way to struggle for liberty, but it is a good way. And it's a personal duty that I ascribe to and encourage in others. So I have a handful of firearms and some spares. Some heirlooms and some firearms of historical interest. How is that nutty? Plus, shooting is fun. And I have a buddy who is also a so-called gun nut that could show me the ropes when it came time to actually SHOOT stuff. And familiarize me with various types so I could decide what I wanted for myself. Huh. Interesting. Looks like nerfed a Leatherman knife. Ostensibly, you can fly with that in your pocket. If the TSA goon doesn't mind the tiny scissors. Also useful for visiting that place Great Britain used to be. Or if your employer is a supa-hoplophobe. 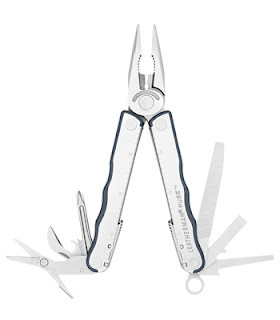 It's a regular Leatherman but without the blade. Instead there is an extra file in that position. Useful for computer geeks, as it has pliers and screwdrivers for futzing around inside the case, and you manicure your nails when the work day is done. Pop a brewski, too. But that didn't stop me from mailing the Card to Dad and sending him his gift already. I really thought it was today. He's just a concerned citizen. Maybe the town council will put some thought into this important emergency response preparation. The Zombacalypse is a matter of "this year, or in the next 5?" Between staying late at work, and going out of town last weekend, and tending to Archie (he's doing much better) I barely have enough time to dash out a blog post. Lotsa stuff happening out there in the gun world, what with the Sheep Dogs turning into Wolves and such, and ammoholic memes and fresh retreads of UN small arms treaty stories, but other bloggers have covered them well. I'm hoping for inspiration tomorrow. Every gun owner should fire a crappy gun extensively for a year. Something that jams a lot. Something that breaks. Something picky about it's ammo and then don't use that ammo. Why? To familiarize him or herself with a crappy gun. To get that experience. To do the failure drills. It will familiarize a person with how a gun works. It's a mechanical device. It operates a certain way. When it doesn't operate correctly you can figure out the way it was supposed to go, and internalize the corrective measure. Like learning the sweet spot on a clutch, and learning the optimal feel on when the engine says it's time to shift. A reliable, works every time, pistol is a joy, but even these will have a breakage once in a blue moon. Second nature correctives are a nice thing to have in your wet ware, and if they don't fix the problem the long experience will give you a good idea on the true nature for further addressing on a gunsmith bench. Knowing at an instant "oh, I limp wristed it" "oh that was a light strike" "oh the magazine spring is going bad" or "oh an internal pin broke" is a useful thing. Lots of folks (hi, nancy!) have called my attention to the B'more police department getting their knickers half twisted over a pro-2A sticker. Telling cops they oughta be careful... it might be one of those people that like the Constitution, and you know them... all violent and not law abiding and stuff. Approach this potential domestic terrist, undoubtedly ready to snap, with caution. But even that might be too much. That might not be the most practical outfit for the Zombacalypse, but it may be the most popular with a subset of population. And pro-Second writer at National Review, Kevin Williamson, is on fire correcting anti-gun group perfidy and the confusion of fellow NRO writer Cliff May. If you buy a machinegun without the rigmorole with the ATF you are committing a felony. If you buy, possess, transport, or make the parts to turn a semi-auto into a machine gun you are committing a felony. Terrists aren't buying machine guns at gun show with no background checks legitmately. If they somehow, on some off chance, are, then all the people involved in the transaction are committing a felony. There is no special dispensation at the covnetion hall where a gun show is held where you can magically acquire machineguns in that matter. There is no law needed to be passed to criminalize this sort of activity. There is no omission to the criminal code that needs to be corrected. Kudos to Mr. Williamson for clarifying and enlightening the unclear and unenlightened. We just observed D-Day again, yesterday. It reminded me of a war movie I like. The Longest Day. And over Memorial Day I rewatched A Bridge Too Far. For the Longest Day you had The Duke, Robert Mitchum, Henry Fonda, Sean Connery, Red Buttons, Richard Burton, Robert Wagner ... hell even Eddie Albert and Paul Anka. But that was in 1962. Harder to assemble that kind of list in 1977 for A Bridge Too Far, but think how hard it would be today. Anyway for that one they got Connery again, Gene Hackman, Robert Redford, Elliot Gould, Michael Caine, Anthony Hopkins, James Caan, Laurence Olivier, Roddy McDowell, and John Ratzenburger. Craploads more. And if you lined up the Academy Awards won by the cast of both movies they could play their own golden OPFOR regiment. Also big name furren actors to play the non English parts. Another movie like that was Saving Private Ryan. Biggish names sprinkled throughout. Not super big, but still a few knowns. It's a war movie. War has LOTS of people in it. You need lots of actors and stuntmen. Or another route, use lesser named and cheaper actors, but release the movie to cable, like Band Of Brothers. Kevin Williamson has another progun blurb on the sometimes-Metrocon-but-less-lately National Review. It's that talk from the Al Queada Berkley dude that advises his fellow jihadists to snap up all those great machine guns at US Gun Shows and go on a killing spree with them. Plenty of other gun bloggers have jumped on all the flaws in that plan. Apparently the terrists get their information on firearms from the San Francisco Chronicle, so what they think they know and what actually is are at odds with each other. Again. Sailor Curt has another, intriguing, theory about that terrist. Update: Cliff May has a follow-up on NRO. Tam brings up a good point wrt to the falling out of favor of pistol carbines on the nations police forces. Cops are adopting short AR derivatives for when they are really serious, eschewing the old favorite, the MP5, or equivalent. So the KRISS carbine has an uphill battle to get widespread adoption of it's .45 submachine gun by the boys in blue. Why are cops going to the AR. Part of it military vets that sign up at the police academdy don't need a lot of extra training. They are already through the familiarization process, at least. And even non-mil cop wannabes have a greater chance of having used an AR platform because it's so ubiquitous. Other reasons? The North Hollywood shoot out in the 1990s. Determined, body-armored, professional bank robbers made a hash out of things when cornered and cops with 9mm pistols were going again crooks with automatic 7.62x39mm machine guns. The police, re-armed with MP5, or what have you, would get the value add in a repeat situation that they'd probably desire, so actual rifle rounds out of the trunk gun became in fashion. Though if the Hollywood cops had had a few .30-30... things would have been less messy too. But a cowboy lever gun isn't as cool. There is also the militarization of police forces that is a sadder commentary on our Republic. If you are going to play soldier in a domestic setting you should have soldier guns, right? It's this last thing that could be the saving grace of widespread adoption of the KRISS carbine, in the unlikely event there is backlash against SWAT abuses and a widespread policy change to revert back to pistol caliber arms for policemen. Unlikely. The cops are still going up against robbers with rifle caliber guns on rare instances, and the cops have already spent a boatload of money getting every member (it seems) of the force a real M4 carbine. Public displeasure with SWAT will have to be much greater to change that inertia and to do that there will need to be MORE future tragedies instigated by our law enforcement with subsequent drops in the morale of more conscientious police officers. I don't want to see either just to help KRISS out. Read another zombie book. Patient Zero. Not bad at all. Some of the amazon reviews say it was slow to get to the action but I didn't think that at all. The intrepid hero is a Baltimore Cop, ex Army, and a Judo Master. Well, some kind of Chop-Socky. And he's a natural killer. He's a bit too superhuman. His name is Joe, not Mary Sue. He is recruited into a Sooper-Sekrit gummint securtiy org by a guy that is some kind of all knowing spymaster that has the good on everyone, including the president, so his people can get a lot done without worrying about red tape. Thank goodness they are on OUR side in the fight against the Terrists. And there is a new terrist, much worse that Bin Laden. He has a sister that is a Mad Scientist Evil Genius type. And there is a greedy BigPharma guy supporting them. Her task is developing a Zombie infection to release upon the world. BigPharma thinks they will make Big Money on the cure, but Terrist McJihad thinks they'll turn the Great Satan into 300 million Shamblors. So double-crossers are double-crossing double-crossers. It's up to hero-guy to stop this. All his action takes place within 150 miles of Baltimore. Standard zombies. Slow and shuffling, hungry, agressive, 100% infection rate from a bite, headshot to kill em. Hero uses a Glock 21, and a S&W 642 Airweight, but not often. An AR type for most shots, and his hands kill more Zed than his pistol. The author is a big martial arts type, and we all know that a Karate Choppa is what you rely on as your go to for effective bad guy retirement. You'll get your pistol taken from you most of the time anyway. T-Bolt sez check it out. So I discussed the 'farm' in my yard and the possible future potato patch. This dovetails into the survival recipe list. I have a good pea soup thing I can make from dried peas. And a navy bean soup recipe. And the boullion and pea and bean stockpile to dip into after the canned goods are gone. I got a bunch of rice too, and I know how to cook that. The hole in my survival prep is a source of potatoes (hence the gardening) and accoutrement to go with making potatoe soup. Luckily, I go do potatoes other ways, but I'd like to experiment with making a yummy soup. Stuff I should stock pile for that... More milk. Cans of evaporated and dried milk. Also, canned butter would be nice. Or at least more cooking oil on hand. And bacon. Something cheaper than tactical bacon. Real cured bacon. And I should get crackin' on some soup recipe until I become second nature. Inspired by Frank... I finally did some farming of my own. Oh sure, the acreage is much less. Only about 120 (square feet). And i don't have the machinery Frank has... And nothing I put in will make me any money or feed any people. But other than that it's the same. No? Ok, no. I hate yard work. When I moved in here 10 years ago there was some sickly azalea bushes, and a couple of rose bushes that became more sickly under my care on my front exposure. The previous owner were decent landscapers and there are bulbs and all sort of nice plantings in other parts of my yard that are maintenance free, for the most part. But the azaleas got choked with weeds and I was tired of looking at them. 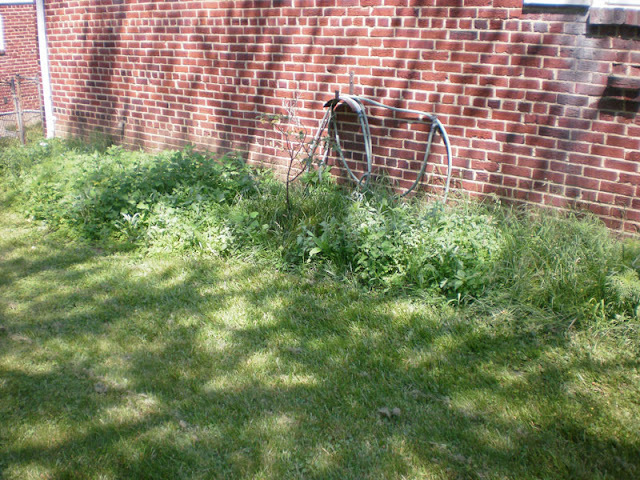 I had a landscaper that mows Archie's lawn come and yank them. Mainly because he would then HAUL AWAY the unwanted vegetable matter. We had a wet spring, but nothing like the Midwest. It was enough to make the dirt patch I had easy to turn over and rake. 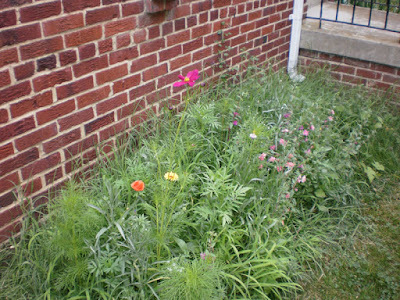 And it allowed me to plant without any watering, as nature was doing that for me nearly every other day. So what did I plant? 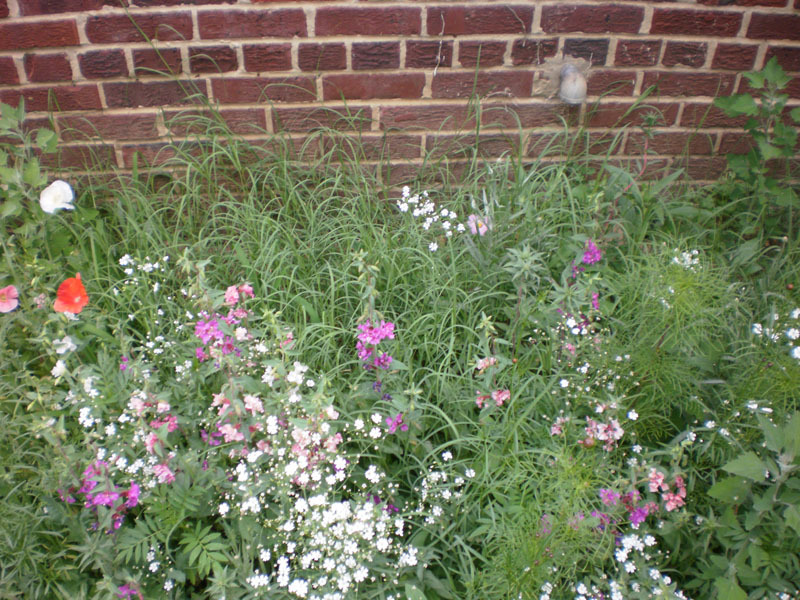 Wildflowers perennials. I'd never bought a see in my entire life, so this is a new thing for me. Not much to look at yet, but lots of little flowering weeds will be peaking here in a month or so. It'll add some color to my front yard, and the roots will keep the soil in place. And they should be summer drought resistant. I left the sickly rose bushed. If I had it all to do over again I'd just junk them. 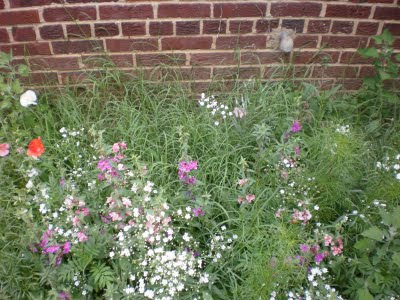 Also, 3 packets of wild flowers wasn't enough. I planted some Black-Eyed Susans, too, but no luck just yet with them. It's our state flower you know. And will volunteer year after year if you let it. 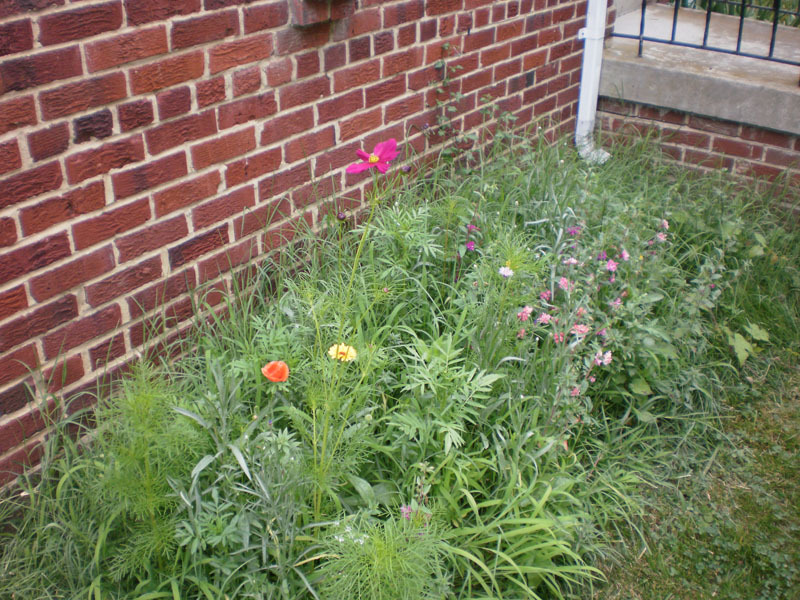 No fertilizer or mulch or topsoil. I hate yard work, remember? Bare minimum of effort expended. Next year, I have a unused bed in the back yard. Maybe potatoes? Just to see if I can. And that is really the point of breaking out the shovel. and hoe. An instructional website on how to fight the coming Zombie Scourge. eHow. I don't know how I'd take their advice. They advocate beheadings. Getting up close and personal with a Zed with edged weapons. Remember if you are close enough to chop off a Shamblors then IT is close enough to grab you and gnosh a little of your precious skin. They also like shotguns. If I told people once I told them a thousands times... don't use shotguns against zombies as a primary weapon. While effective on a few, zombies come in hordes. Shotguns are slow to load, generally, and the ammo is relatively heavy and bulky to carry enough of. They are a specialty weapon. C'mon people, you've used a shotty in first person shooters, you KNOW this. They misname a group of zombies as a 'flock.' Zombies don't flock, like birds or sheep. Birds and sheep aren't as malevolent. A group is a known as a Horde. And are as dangerous as 100,000 angry Mongols bearing down on your village in the Ukranian Steppe. Take the advice with a grain of salt. SWAT came to Breda's town and interrupted some guy's TeeVee watchin' with a flashbang. Surprise! They were responding to a call from his girlfriend because apparently he was tired of putting up with her. For this they get a junk on the bunk shot (one plastic Austrian pistol that went with his toter's permit and... nuthin...), and send him for psychiatric examination because she was sure that he'd be suicidal since he was no longer with her (I mean, who wouldn't be?). They gotta account for the property damage somehow, I guess. What's the next SWAT overkill story gonna be? "Officer, my cat, Snookums, is stuck up in a tree, can you send someone to help me get him down?" "Don't worry ma'am. SWAT is bored and hasn't really been putting their expensive taxpayer-funded training to use. We'll send them over and if the flash bang doesn't get Snookums to surrender, we'll go full breach!" Why do we tolerate our police playing soldier when there is a perfectly good military where turn in their civilian creds and actually BE a soldier. Someone could get HURT by these reckless bastages.